Westport Teens Adventures, Language & Surf Camp - Co, Mayo Guests overall rating: ☆☆☆☆☆ 0 based on 0 reviews. Westport Teens Adventures, Language & Surf Camp has full residential facilities for 100 campers in single, double and multi-bedded rooms. Secure, private location on the outskirts of Westport Town. All activities are either on site or on nearby beaches and mountains. Exciting Activity Zone on site, including water sports, high ropes, climbing tower, archery range, team tasks, aeroball & more. Our own surfing site changing facilities available nearby. The Centre has full residential facilities for 100 campers in single, double and multi-bedded rooms. Secure, private location on the outskirts of Westport Town. They are clean, but no-frills accommodation. They are checked and cleaned every day. Campers are responsible for their own personal space. Staff members sleep nearby to campers, with additional night-time security patrols. Safe, fun and friendly environment, Leaders we be always on hand to help any way they can. Children over the age of ten are granted a little more freedom than the younger children, and they are given the opportunity to try ‘tasters’ of all activities before they decide where they will pour their energy for more prolonged periods of time. Our teenagers are treated like young adults, more flexible schedule, free time but also under the supervision. Ireland Summer Camps are all about having fun where every camper is a winner. They can learn more about themselves and we encourage campers to take healthy risks, celebrate success, and promote self-confidence and self-esteem. 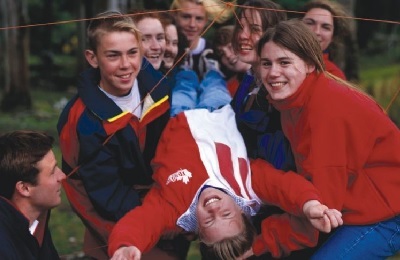 We are fully aware that safety and security are critical issues for you, our combined experience of over 60 years in outdoor education and coming from a school-teaching background, and as parents ourselves, we have an instinctive understanding of the importance of not placing campers in dangerous or insecure situations. For all aspects of our operation, are updated regularly and are available for inspection when visiting our centers. If you are beginner it’s about learning the basics of Surfing so you can get up on your board and ride the waves, no experience needed apart from being confident in the water and a willingness to get wet. The Lessons are going to be at Carrowniskey Beach (one of the finest surfing beaches on the West coast). 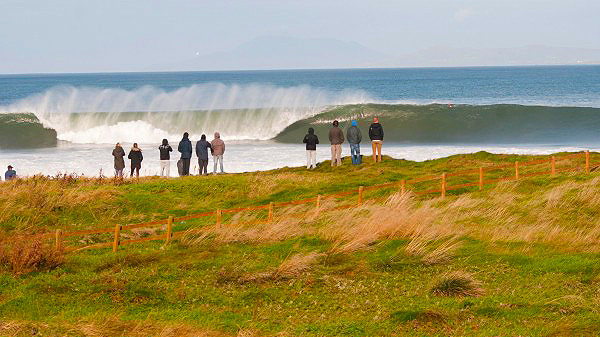 It’s just 15 minutes from our Camp base in Westport, Co. Mayo which is fast becoming the Adventure capital of Ireland. 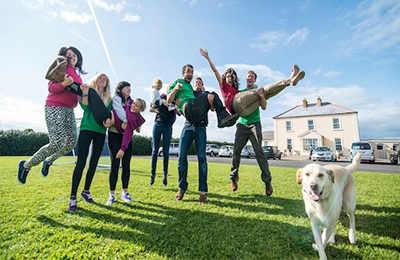 High-quality English Language Programmes in the company of English speaking Irish students combining action-packed, academic expertise, exciting Cultural, Activity Programmes and rewarding residential Irish Experience is the best experience for a teenager. A. English Classes with Activities: students have formal English classes (15 hours) Monday to Friday mornings. Skills: reading, listening, spoken, comprehension and language development. Students spend their afternoons participating in exciting activities with their Irish and international friends which requires them to speak English to communicate. Even without spending a time in a classroom to spend time with Irish and international friends on daily bases encourage rapid language development speaking confidence while making new friends and having fun. Shopping: St. Stephen’s Green Centre, Grafton Street, Liffey Valley and Dundrum Town Centre. Museums: The Guinness Storehouse, The Natural History Museum and The National Gallery. 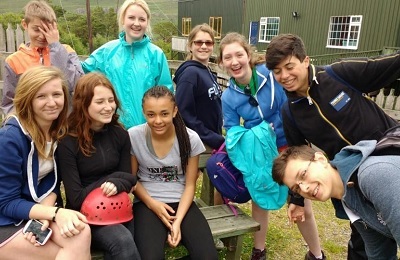 Apart from the Surfing, our Westport Teens Adventures, Language & Surf Camp has an exciting range of Multi-Activities that will keep you occupied when you’re not surfing (or if the weather rules out surfing). The Hotel at the edge of Westport Town on the shores of the Atlantic Ocean. All activities are either on site or on nearby beaches and mountains. Spectacular views peaceful surrounding. It is very important for our planning to have your arrival & departure details as far in advance as possible. Please remember that all flights times must be between 10am and 5pm in Dublin. Our group leaders will be waiting for the arrival of your child wearing a brightly colored uniform and holding Camp signs. Your child will be escorted to the camp, where the fun will really begin. 1 Full Day & 2 Half day excursions including Entrance Fees. Customer Protection Plan: Irish Residents €35 per person per week; Overseas residents €50 per person per week. Please be advised our arrival times at the airport are between 10am –5pm on Sundays. If your child arrives outside of our scheduled pick up times please contact us as an extra charge will be incurred.